Eight breathtaking mountain passes link the Wartrail/New England districts with Barkly East, Rhodes and Lady Grey. Bidstone Cottages is ideally positioned as a base to explore this Eastern Cape mountain wonderland. Bidstone Pass (Volunteers Hoek Pass) – From Tiffindell Ski Resort to The Wartrail. Tiffindell Resort was established in 1993 and gives South Africans an opportunity to ski on home soil. The south facing ski slope offers up to 3 months of winter snow and is a great way to learn the sport. The Bidstone Pass starts off on the high plateau, offering dramatic views of the surrounding peaks; and then winds its way down to the Wartrail valley and its farming community. The road is narrow with some precipitous drop-offs, so do pause to check for oncoming vehicles coming up the pass as they have right of way. After the steepest section, the road gives wonderful views of Halstone Krans and the farmlands below. Bidstone Cottages is the first guest house at the top of the river valley. Carlisleshoek Pass – From Rhodes to Tiffindell Ski Resort. Rhodes village is a walk down memory lane, with quaint Victorian houses, peaceful sandy streets and a lost in time atmosphere. Despite the sleepiness of this village, Rhodes is home to some colourful characters, making the pub at Walkerbouts Inn well worth a visit! The road up to Tiffendell from Rhodes is astounding and steep. The zig zag cement strips need concentration and control, but the summit road to the ski resort makes the challenge worth it. Approaching Tiffindell Ski Resort you will pass under the highest point in the Cape (3.001m above sea level). Known by local tribes as ‘Makhollo’ (Great Mother), the Europeans named this peak Ben McDhui after the mountain in Scotland and it is affectionately referred to as BenMac by local residents. Naudes’s Nek – From Maclear to Rhodes. 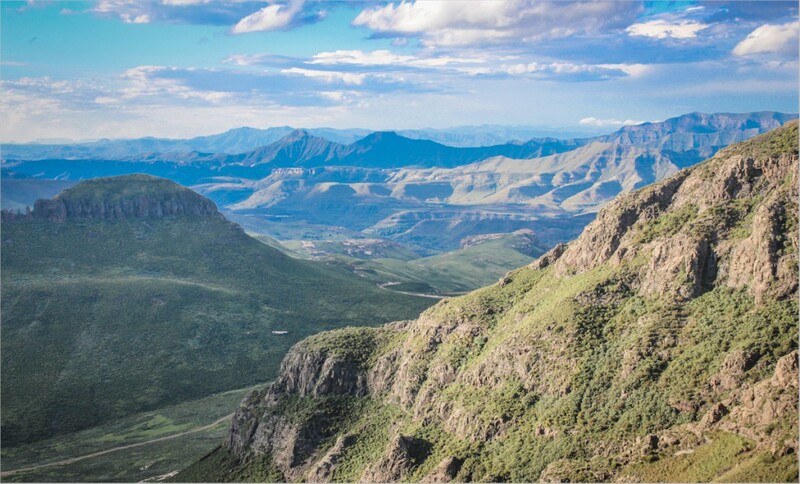 The summit of Naudes Nek is over 2,920m above sea level, making it the highest dirt road pass in South Africa. In the 1890’s the adventurous Naude brothers carved out a road following the instinctive path of the horses. Naudes Nek is still a challenge in our comfortable 4×4 vehicles. Local advice should be heeded with regards to weather and road conditions before taking on this unique and spectacular drive. Joubert’s Pass – From Lady Grey to Barkly East via the Witteberg. The third highest pass in South Africa, Joubert’s Pass traverses the Witteberg Mountains in a panoramic loop. The road passes through beautiful farmlands before rising up through the Lammergeier Nature Reserve. Each year extreme adventure racers run across these exposed peaks in the 100km Skyrun which ends at the Wartrail Country Club. The descent brings you into the quaint village of Lady Grey. A scenic picnic stop at the 25m town dam wall is a highlight, featuring a natural stair case to the top of the dam wall. The impressive Dutch Reformed sandstone church is a National Monument and hosts the well attended Passion Play each Easter. Lundean’s Nek (Lundins Nek) – From Wartrail to Telebridge Border Post. The vibrant Wartrail farming community is mostly inhabited by direct descendants of the original settlers to the area, complete with local Country Club dating back to 1886. Lundean’s Nek connects this part of the Eastern Cape to the Lesotho border at Telebridge. On the way up you will pass by the remote Lundean’s Nek army base – whose primary role is to prevent livestock rustling and contraband smuggling between Lesotho and SA. Just beyond the army base the summit of the pass provides panoramic views of the Maloti Mountains. As the road winds down towards Telebridge the river to your right forms a natural border with Lesotho. This area was part of the former Transkei and you will pass remote mountain villages where traditional cultures and farming practices remain a way of life today. Otto Du Plessis – From Clifford to Ida. On the way to The Clifford from Lady Grey you will see the unique railway linking Barkly East with Lady Grey to the northwest. Owing to the mountainous terrain, a system of eight ‘reverses’ was incorporated into the line, which has a gradient of 1 in 36, one of only two such systems in the world. The Class 19D steam locomotive that stands in Barkly East’s square is a reminder of the early days of rail transport. From the Clifford turn-off the road ascents steadily through farmland until reaching the summit of Otto Du Plessis pass. This point has grand views from the top of the escarpment over the Tsomo valley. It is reputed that on a clear day it is possible to see the Indian Ocean. As the pass descends to Ida it winds through sandstone gorges, forests, farmlands and across rivers in a breathtaking mountain wilderness. This variety of habitat means that Otto Du Plessis is one of the best birding passes in the area, so keep your eyes open for mountain ‘specials’ that include Drakensberg Rock-jumpers, Ground Woodpeckers and a variety of siskins. Bastervoetpad – From Barkly East/Elliot to Ugie. The Bastervoetpad is named after a breakaway group of freed slaves who made their way down this tricky pass to a new settlement near Ugie. This challenging but splendid road links the top of Barkly Pass to Ugie and combines technical driving with stunning views. The road is rough in places, so high clearance vehicles are recommended and 4×4 in wet weather. The rock formations in the area are of interests to geologists as there is evidence of glacial formation. The views at the top of the pass are breathtaking and reminiscent of The Scottish Highlands. Barkly Pass – From Elliot to Barkly East. Barkly Pass is the only tarred road on the 8 passes circuit, but is still not to be underestimated as it can be treacherous in wet or icy weather. The imposing sandstone buttresses and rock formations are magnificent. See if you can spot the tortoise at the top of the pass, and the hiking boot (complete with sock and laces) further down. Barkly East is well known for its sheep farming, but a lesser known claim to fame is that the town has recorded snowfall during every calendar month – although not in the same year!